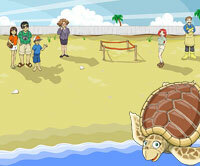 WaterLife is a series of educational games about our nation's ocean and coastal resources. The games provide challenges for students at the fourth through seventh grade levels to learn important science content about human impacts on ecosystems and marine species. Sea Turtles and the Quest to Nest helps students address the most important issues facing loggerhead sea turtles on land and in the ocean, and gives them practice making difficult decisions involving multiple stakeholders. 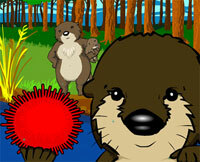 The WaterLife game series was developed through a partnership with Montgomery (Maryland) College's Computer Gaming and Simulation Program. Where Rivers Meet the Sea takes place in a west coast estuary and follows a human, Valerie, as she encounters Oscar the sea otter, and the Claminator, a geoduck clam. The friends are challenged to learn about the factors that produce healthy estuaries, food webs, and why estuaries are essential to ocean life and to humans.